Flow EQ Tanks. Flow Equalization Tanks. Flow equalization is one of the most effective management procedures for wastewater treatment plants. Steady state conditions are created when the influent flow is equalized over a defined period of time. With equalization, you can provide a more uniform effluent to biological treatment processes, especially in the popular BNR (Biological Nutrient Removal) processes. The equalization tank(s) must be sized to absorb and even out the peak flows coming from the collection system. Equalization + Steady State conditions = Improved Effluent + Reduction in operating $osts. 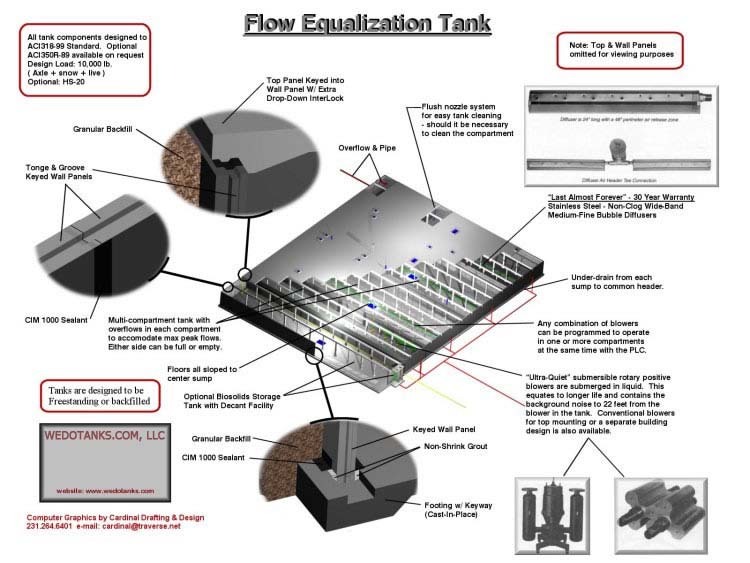 No need to design for large peak flows, the EQ tank equalizes the flow and spreads out the peaks. Especially in BNR plants, control the DO to first stage anaerobic reactor. For simple and easy process control after the Equalization tank, use our Treatment, Optimization and Design software – Sasspro®V2.